http://www.engvid.com/ Do you want to sound smarter? 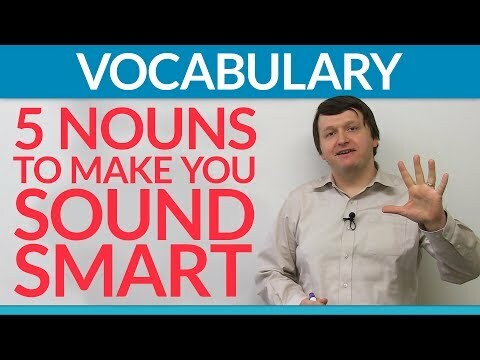 In this lesson, I'll teach you five advanced nouns that you can use in the classroom, at the office, or with friends. Start including these nouns in conversations with your boss, or use them in essays to impress your teachers. You'll sound smarter in no time! Expand your vocabulary, and make a better impression on the people that you meet. Learn these five nouns with me now! http://www.engvid.com/5-nouns-to-sound-smart/ TRANSCRIPT Hey, guys. I'm Alex. Thanks for clicking, and welcome to this advanced vocabulary lesson on five nouns to sound smart. In this lesson, we will look at five words that are a little bit more formal and you can use whether you're giving a lecture, if you're doing any type of formal writing, if you're writing an essay, if you're giving a speech in front of a crowd of people, and you can also use it in everyday dinner conversations if you want your friends to think that: "Hmm, this guy is using some really high-level vocabulary", or: "this girl". Let's start with the word: "bedlam". So the sentence here says: "The streets were in bedlam during the protests." "Protest" is a word some of you Spanish speakers, Portuguese speakers, you might use the word: "manifestations". In English, we say: "protests". All right? So: "The streets were in bedlam during the protests." So if you imagine a protest happening with a lot of people, you're probably imaging lots of chaos if it's not a peaceful protest. Okay? So, "bedlam" basically means chaos and disorder, something that is not organized. And we often use the preposition, "in" before "bedlam". So: "It was in bedlam. ", or: "The streets were in bedlam." or: "It's bedlam in here." It's chaos, it's disorder. Okay? The next noun is: "gall". Okay? So if we look at the sentence: "She had the gall to call me lazy!" So if someone calls you lazy, you're probably very offended and you think: "I can't believe that person said that." I can't believe they had the nerve - okay? - to actually say that. So, "gall" basically refers to the bold courage or the nerve to say something. So it refers to your nerve or bold courage. Okay? Next up, we have: "juxtaposition". Very good word, especially in academics and especially if you're writing essays of comparison and contrast. So the sentence we have is: "A child next to an old man is a strong juxtaposition." So, the word "juxtaposition", the word "juxta" actually means near and "position" means position, so near in position. When two things are in juxtaposition, it just means they are near to each other, placed next to each other. And we often juxtapose which is the verb form, we juxtapose two things that are different from each other to compare them, to contrast things. Okay? So, basically, "juxtaposition" means near in position. And commonly, this word is used when you want to compare and contrast two things that are not the same, that are not alike. So you place things in juxtaposition with one another, near to each other, and then you can compare them, contrast them. Okay? Next up: "quagmire". If we have this sentence: "The war has created a quagmire." So when you think about a war happening anywhere in the world, it's probably a very difficult situation for citizens and that is precisely what a quagmire is, is that it's a difficult, hard situation that is difficult to escape, that is difficult to get out of. All right? So a quagmire, we're going to say a difficult situation. Okay? So think about being stuck in like mud and... And you can't really escape or it's difficult to escape the mud. And specifically, we more talk about the situation of, you know, wars or personal situations that are quagmires. And finally, we have: "rabble". And in this sentence, we have: "The police couldn't control the rabble." So, the rabble, going back to protests, refers to the common people. Now, the rabble specifically refers to a group of disorderly people or a mob you can say. So rabble is basically a mob of common people or citizens. And just to give you one bonus vocabulary, the word, "rabble", a person who excites the rabble, excites the common people and leads the protest is called: "a rabble rouser". And I'm going to write that here for you guys, "a rabble rouser". So this is the person, the person who excites the people, and says: "Come on, let's go! We're going to fight back against the government or fight back against the police." They are called "a rabble rouser" because they excite or rouse the rabble, the common people, the mob. Okay? All right, guys, so one more time. "Bedlam" refers to chaos and disorder. "Gall" refers to the nerve or the courage, the bold courage to do something. Juxt-... "A juxtaposition" is basically a comparison of two things that are next two each other. "A quagmire" is a situation that is difficult to escape from. And "rabble", a mob of common people.